As Venus moves into Scorpio today, you may feel the urge to turn inward and explore the deeper, darker, more mysterious regions of your psyche. 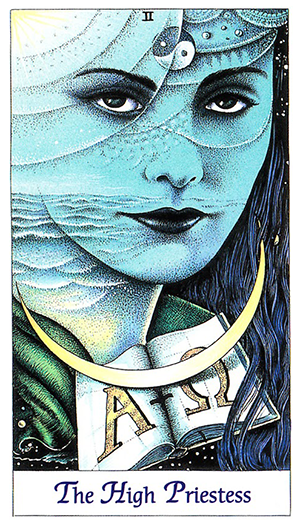 The High Priestess — this version from the beautiful Cosmic Tarot — represents a call to listen to your intuition and heed your inner voice. It challenges you to look beneath the surface and find hidden nuggets of information that can help you round out the vast reservoirs of knowledge you already possess. She’s associated with wisdom and insight, psychic awareness, and a sense of “knowing” even when there is not a factual basis for it. The High Priestess is at home in the world of arcane knowledge and esoterica. She’s both young and old, masculine and feminine, innocent and wise. She is the keeper of secrets, knowledge and mystery. You may be getting more in touch with your own intuition or experiencing profound instances or deja vu or synchronicity. It’s important to embrace these visions and try to understand them, rather than shying away from them. 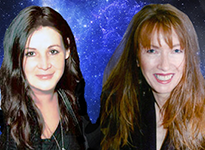 They can bring insights into not only your own personal choices, but the direction you need to be heading in the coming days. Who says you can’t have it all? Who says that every single thing that you could possibly wish for isn’t right there within your reach? Think about what makes you truly happy and chances are good it’s the simple things in life. Home, family, friends, health, material comforts and peace of mind. This is what the Nine of Cups is all about and if you’re not where you want to be just yet, think of ways to change that. 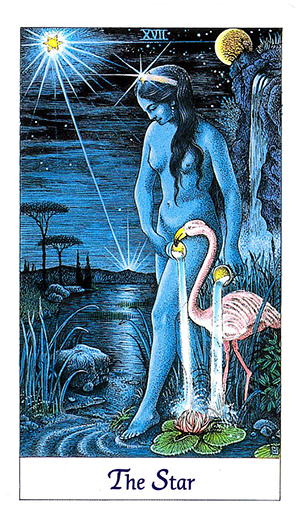 The Nine of Cups — this version from the beautiful Cosmic Tarot — is about manifesting your heart’s desires. Nothing is taken for granted and nothing is left to chance. It’s about aligning yourself with the universal laws of attraction and getting what you deserve. The Nine Cups in this card are always full. They’re filled with love, gratitude and abundance, which are endlessly intertwined. They’re filled with hopes and dreams and miracles which are yours for the taking. 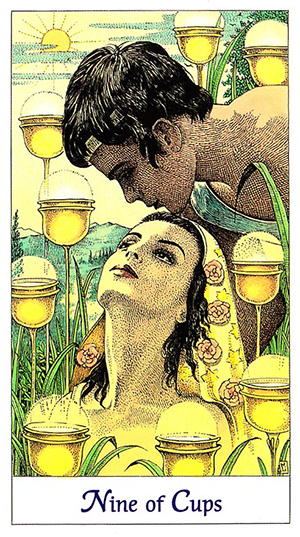 The Nine of Cups is a card of satisfaction, fulfillment and contentment. It speaks of being more than just satisfied with your lot in life, but also feeling truly blessed and grateful with where you are. This card is called “Happiness” in some decks and the “Wish card” in others. But those aren’t always the same thing. So be careful what you wish for as it may or may not bring you happiness. Take some time to think about what you really want today — and don’t forget to be grateful for what you already have. There’s an intricate balance between gratitude and personal fulfillment, so make sure you’re putting enough energy and effort into both. Today’s New Moon in Virgo brings with it a partial solar eclipse of the Sun. As the Moon crosses between the Sun and Earth, it obscures the Sun’s light for a brief moment in time before it reveals it again, with newfound insight and clarity. 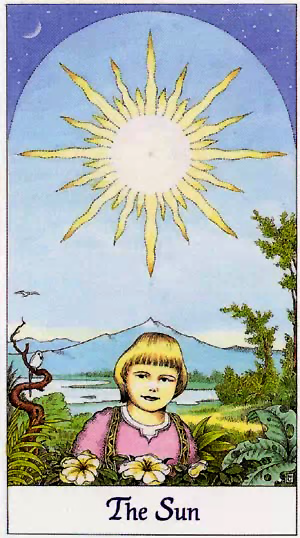 While the Moon in this version of the card — from the beautiful Cosmic Tarot — is clearly less than full, the important feature here is the Sun shining brightly, spreading its golden rays over the land. It warms the earth and brings life to the valley below. The Sun card represents energy and vitality. Feeling alive and happy to be alive. It refers to getting in touch with your inner child, your true authentic spirit, the part of you that longs to embrace life with ever fiber of your being. Today’s eclipse can take that away from you for a moment, and have you reflecting on what needs to be changed. What is no longer working for you? What needs to be put to rest? And what do I want to manifest in my life from this day forward? These are the things you want to be thinking about today as you bask in the Sun’s warm light. Jupiter trines Uranus today, bringing with it unlimited potentials for reaching toward your highest goals and aspirations. 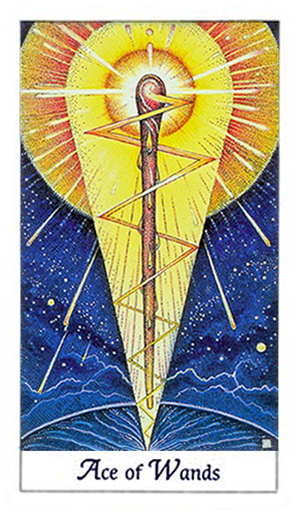 The Three of Wands — this version from the beautiful Cosmic Tarot — is a card of opportunity and personal expansion. It encourages us to look at what we’ve already established as we plan our next moves. In this case the woman in the card has somehow manifested three lotus blossoms in the middle of the desert. She raises her arms to the Sun in gratitude and prayer as she meditates on how far she’s come. 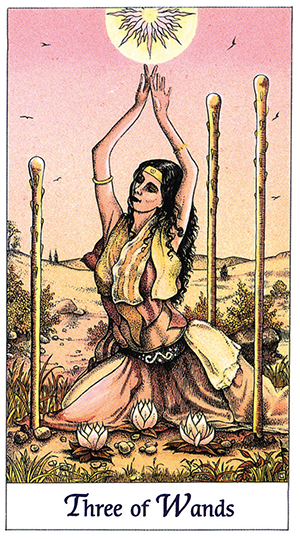 The three wands that are placed in the earth around her provide structure and stability, while she ponders her next move. This woman is graceful and calm. She appears to be blossoming, just like the lotus blossoms growing out of the sand before her. She’s aware of what she’s created thus far, and knows that it will take a combination of serenity and confidence to keep her vision alive. This is not the time for her (or you) to sit back and rest. It’s important to keep working toward manifesting your goals. As with all Threes, the Three of Wands encourages you to network and interact with others. Whether this means sharing your ideas, communicating your visions, or accepting offers of assistance, there are always advantages to joining forces with like-minded people. Although the woman in this card is very much alone. She doesn’t appear lonely and she’s aware of the life sprouting around her, even in the desert. There are also birds flocking toward her in the sky and shadowy figures moving toward her in the distance. The Three of Wands encourages you to push past your limitations and expand your horizons. It will mean stepping outside of your comfort zone and exploring uncharted territories. And while you may run into pitfalls or have to take detours along the way, know that these are often blessing in disguise that can open up a whole new world of possibilities. As Saturn has now left Scorpio and entered Sagittarius there is a definite difference to the energy around. It is as if you have been released from the constrictions of the past few years and there is a brighter future coming your way. Sagittarius always has a way of making everything seem brighter and more positive and this is right in line with the energy of the Ace of Wands. Any new project you are thinking of starting now would be a great time to begin. The image on this Ace of Wands suggests there is a correlation between what you are thinking of doing on a higher level and bringing it into your life. If this is the case it will not be difficult. Things will fall into place for you almost seamlessly as your thoughts and actions correlate to what is around you and help comes from unexpected sources. There is an abundance of energy for you whether this be physical or mental and with this energy plus more importantly you are able to channel this energy into whatever you are doing. This is a good day to plough through your workload. If you have been falling behind with your work this is the day to get on top of that. If you look at the image there is a sense of “as above, so below” as the energy is interconnecting between the Wand. This also gives a sense of balance to your life today as you are blessed with a sense of rightness in what you are planning to do. Great ideas start with a small spark and I suggest you follow your heart with any small spark that comes your way today… you never know where it will lead you. It is no coincidence that we also see Mars trine the node today giving a sense of fate to the energy you are experiencing. Today — with Mercury and Jupiter in semi-sextile — you want to work on trusting your instincts and staying tuned in to your environment. The Mercury /Jupiter aspect can act as a trigger for internal conflict and mental discord. Anxiety. Uncertainty. It can cause you to be touchy or “jumpy,” guarded and apprehensive. You could be dealing with trust issues, as in questioning other people’s motives or agendas. You could be questioning your own instincts, or fretting over something that just feels “off. It can be especially challenging for you to navigate through uncharted territories, much like the woman in this version of the card. There are elements of fear, uncertainty and even paranoia associated with this card. This usually comes from overthinking and over-analyzing things to the point where your own intuition becomes hopelessly compromised. While there’s no question that there are situations that call for you to be more guarded, you don’t want to make things worse by projecting your suspicions onto others. 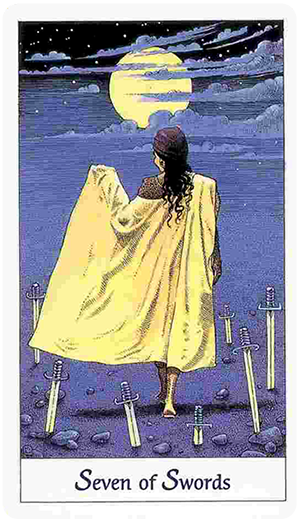 The Seven of Swords calls for you to be mindful and alert, but you want to be just as aware of the potential for jumping to illogical conclusions. This Mercury Jupiter transit is considered “minor” but it can wreak a lot of havoc. Especially if you’re easily distracted or given to emotional reactions.